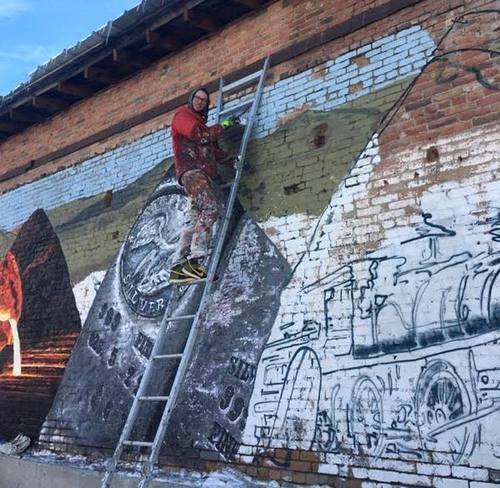 A mining mural and a cowboy silhouette were recently added to two historic buildings on Main Street, Eureka, with the hopes of helping revitalize the downtown. 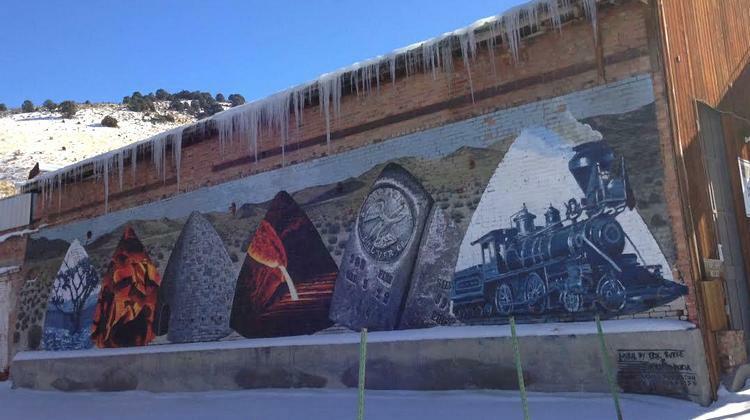 Eureka Restoration Enterprise (ERE), a small non profit whose goal is to help beautify and rejuvenate the downtown area, commissioned two muralists with a request for a mural that depicted Eureka’s rich mining and agricultural history. “We want to entice entrepreneurs to help create a vibrant downtown for the local population as well as to entice the many Highway 50 travelers to get out of their cars and spend time in Eureka,” said Amanda Pearce, ERE co-founder. After raising funds from an art and wine walk held in May of this year, the group set out to find an artist whose work embodied their mission. 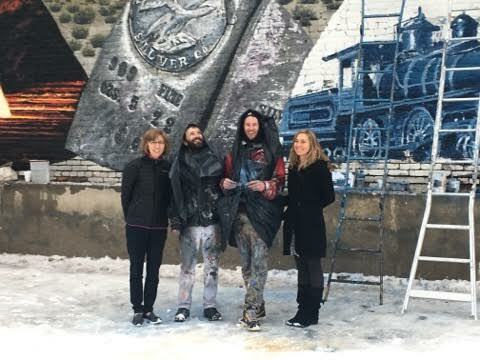 After noticing an article in the Reno Gazette-Journal about muralist Erik Burke and his work at the Reno Aces Ballpark (which depicted the local history of a train traveling through Donner Pass and a portrait of railroad surveyor Theodore Judah) they knew he was the one for the job. Local business owners Maria Urena and Santiago Martinez who own and operate the Urban Cowboy Bar & Grill (formerly Ratazzi’s), agreed to allow ERE to use the exterior of their building as the first site for a mural. A second mural was added to the old Pavilion owned by Mike Rebaleati. Artist Nicolas D’Auria came up with the idea for a silhouette of a cowboy, but wanted a local influence. Fifth-generation Eureka native Mark Damele agreed to stand in for the job. The two artists projected Mr. Damele’s profile onto the side of the building after dark and finished that project in one evening. The local non profit first traveled to Ely where they visited with the Ely Renaissance Society, who were instrumental in beginning the mural project there with the belief that it would attract businesses and tourism to the area. “They stressed to us how once the art component of revitalization was introduced, they started to generate more interest from the locals,” Pearce said. In addition to funds raised from the wine walk and raffle, ERE received financial support from the Nevada Arts Council and the GRP Pan Mine.